How do you say this and that? “Between the two” OR “among the two”? What is the best sounding and most probably the right phrase to use between the two or should I say, among the two? Is there a tool that can help me with this? Francesco Benetti from Italy had the same problem so he created Phras.in, a website that helps you decide on what phrase to use. Simply enter two phrases that’s making your day miserable and watch the site show you the number of results instantly. 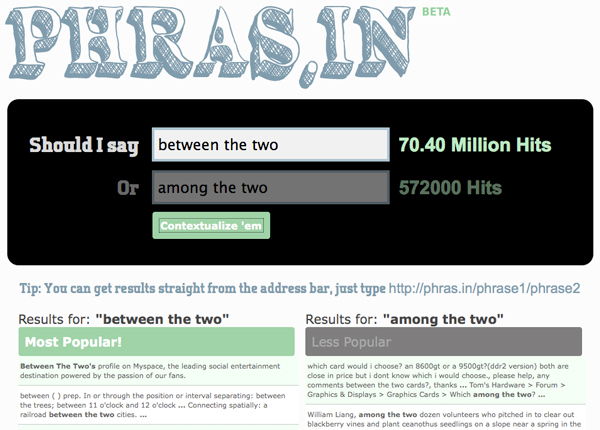 Hit the contextualize button and see a side-by-side comparison of the two phrases based on its results. It’s a cool tool but does not necessarily mean that it’s a neat one. It’s still best to have a thesaurus and a dictionary close to you because the assumption that having higher number of results indicate common use and probably the right phrase does not really sound right. Phras.in, however, is a fast tool that’s nice to have around especially when you’re in search of the right phrase. So let me go back, “between the two” or “among the two”? Let the results speak for itself.